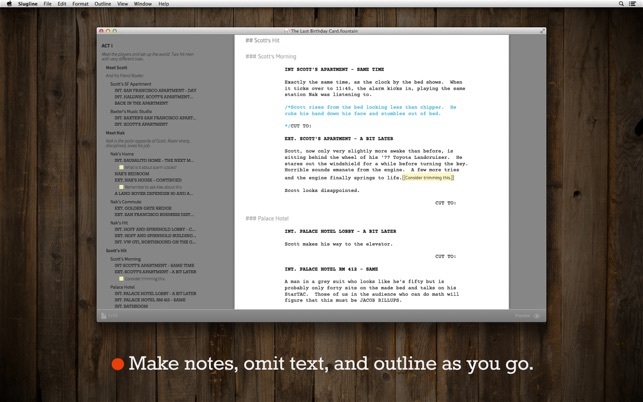 Slugline is a minimal, distraction-free environment for the most important part of screenwriting—the writing part. Slugline works with plain text. It automatically turns your writing into a properly formatted screenplay, without you ever needing to press the Tab key or touch the mouse. No buttons. No settings. Just writing. 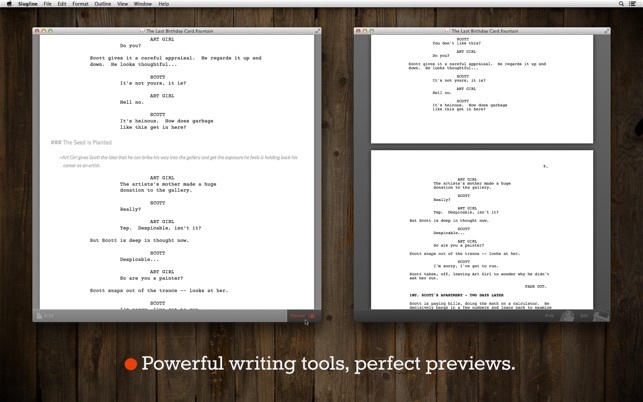 Slugline is built for the hard part of screenwriting: the writing part. Slugline gives you the tools you need to craft your story, without your hands ever leaving the keys. Slugline is the creation of filmmaker Stu Maschwitz and software designer Clinton Torres. Fountain is a collaboration between screenwriter John August and Stu Maschwitz.​ Together, we believe that screenwriting should be simple, smart, and open. Slugline keeps getting better, and that's thanks to you! Slug us a line at http://slugline.co/contact with any questions or feedback you have, and follow us on Twitter at @SluglineApp. Slugline 1.3.1 is all about performance, Undo, and performance. And performance. ⋮ Performance! Slugline scrolls smoother and keeps up with your typing better, even on very large, complex documents. ⋮ Performance! Slugline should be less greedy with your laptop’s battery. ⋮ Undo now un-does blocks of typing, rather than one letter at a time. ⋮ Typing the @ symbol, the trick for forcing a Character element, now brings up an auto-complete menu of any forced Characters already in your screenplay. ⋮ After pressing Return to choose a Scene Heading prefix (INT, EXT, etc.) from the auto-complete menu, the cursor now remains on the line, so you can keep typing your Scene Heading. ⋮ Undo-ing the creation of a Character/Dialogue pair no longer inserts random garbage into your screenplay. “That’s my job,” you joked, but, hey, take it easy on yourself. That kind of self-doubt adds up. ⋮ We fixed a potential memory leak. ⋮ When reverting to a saved document, the “Loading” spinner should go away now, rather than stay there for four to eight years. ⋮ And (most recently), fixed some compatibility issues with High Sierra that were causing crashes around parentheticals. Each new update provides a blank canvas for your generous reviews. We are always grateful when you share your feedback with us, either here or at slugline.co/contact. Happy writing! I like Slugline a lot, and find that Fountain fits really well into my workflow. 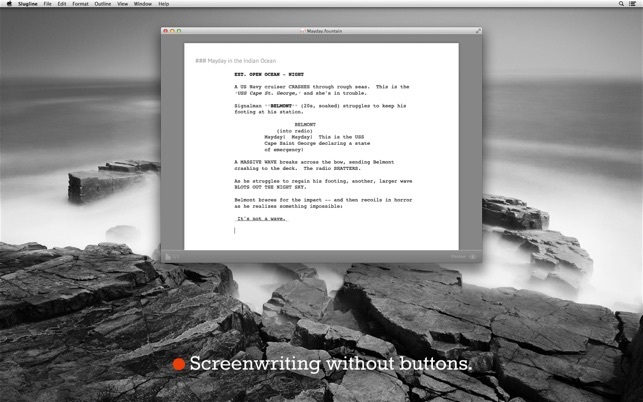 For an initial draft of a screenplay, or for smaller pieces, it’s clean and easy to use. It’s no Final Draft, but if you don’t need features like revision tracking, character reports and so on, this will do just fine. It runs very smoothly and is far more streamlined than Final Draft. And of course it’s like 1/4 the price and doesn’t come with Final Draft’s awful instability, sluggishness and onerous registration system. Since I wrote this review, Highland (another good Fountain-based screenplay app) has stepped up its game significantly, but I still find Slugline a bit smoother with element recognition and auto-complete. How is this rated so high? I’ve been using this for a couple of hours and have to say, this is the most unnessessarily confusing screenwriting app I have ever used. I have been searching for an app tp replace Adobe Story which is an amazing application, and was told Slugline was the way to go. They talk about how intuitive it is but it’s not. I’ve spent the past 45 minutes trying to get a title page formatted properly to no avail. I followed all of their instructions in their help section but it was in fact not helpful. What would be helpful is if they had video tutorials explaining how to format things because not everything is as easy as type a name in all caps and its recognized as a character. A lot of things are actually poorly explained when written down and the examples are useless, if there were a visual aspect where you’re watching them perform the actions THAT would be actually helpful. I’ve been using Slugline for maybe three years now, and in those years I’ve had no major qualms with this software. 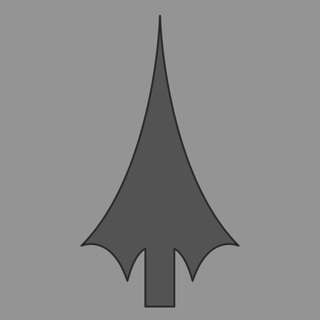 - I love Slugline’s simplicity as well as the formatting and outlining capabilities. 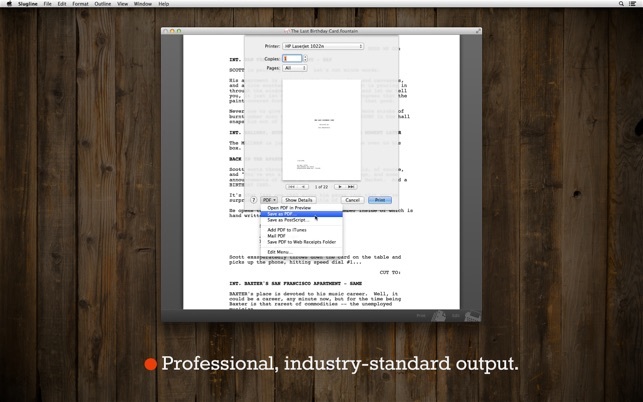 - Adding notes to the script is really easy, and that’s one thing I really appreciate. Although it’s not necessary, I would love a mobile version of the software. Just for easy, on-the-go access in case I don’t have my laptop (which is rare, but it has happened before). Doing this would require Cloud support, which is another thing I would like to request. Not a huge issue since any script you write you can just drop it in to the Cloud. One last thing: as others have mentioned, an option to number your scenes would be cool. Overall, I love Slugline and would recommend it to any screenwriter. 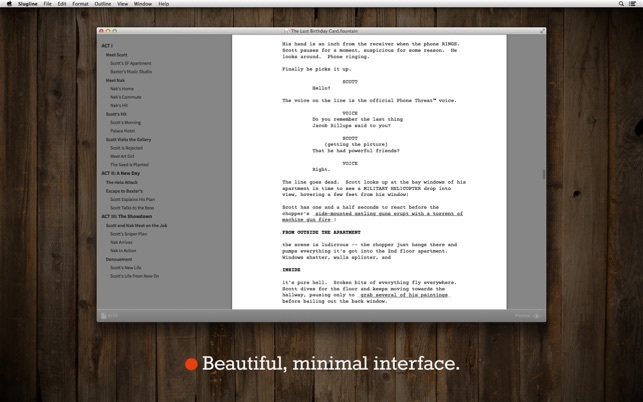 I recently moved to Final Draft just to be acquainted with other screenwriting software; so far it’s nice, but Slugline is definitely an app worth using if you don’t want to spend as much.